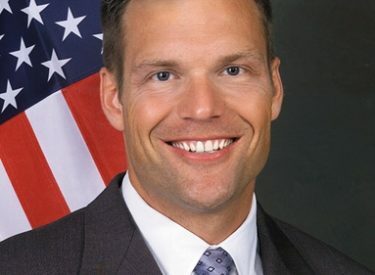 The co-author of the controversial Arizona Immigration Law SB1070 and candidate for Secretary of State in Kansas, Kris Kobach will be in Liberal on Saturday night at 7 p.m. for a candidates forum. Kobach is an American law professor and is currently on leave from the University of Missouri ? ?Kansas City School of Law (UMKC). He is also currently of counsel with the Immigration Law Reform Institute in Washington, D.C.
Kobach is a regular guest on FOX News, appearing as recently as last night on the O’Reilly Factor to talk about a judge’s decision to block parts of SB1070, which went into affect yesterday. Kobach’s opponent in the Republican primary for Secretary of State, JR Clayes will also be in Liberal on Saturday night, along with Dave Powell who is running for Insurance Commissioner. The forum will take place at the Mid-America Air Museum Theatre at 7 p.m. The public is invited to attend and the format will allow the public to ask questions along with follow-ups. There will also be door prizes given away. The event is being sponsored by the “We the People” group in Liberal, and the “November Patriots” from Kansas City.